Imagine if a vending machine met the farmer’s market. How would the black plastic and metal keypad interact with the green produce and intimacy of the vendors? Would the M&Ms and goat cheese hit it off? 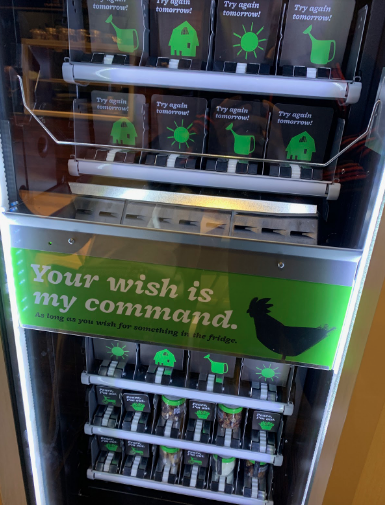 This winter, the Farmer’s Fridge – a new vending machine in University Library, Mudd Library and The Garage – brings this imagined friendship to life. But instead, the goat cheese outright dumps the M&Ms for a Maple-Chili Spiced Nut Mix. 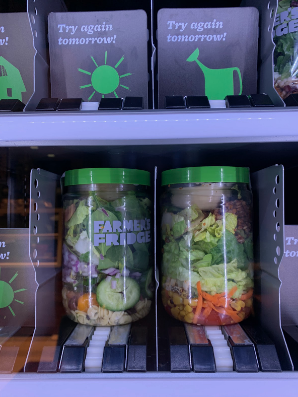 The Farmer’s Fridge challenges the idea that vending machines only offer junk food. 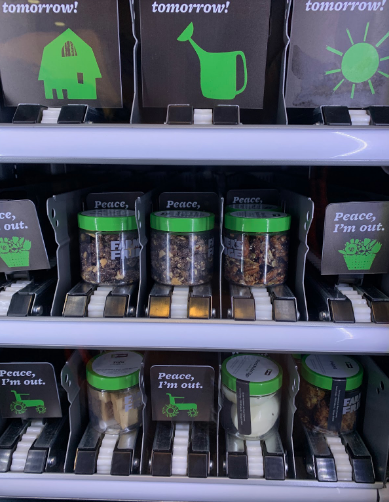 With its white wood, green accents, touch screen and round plastic jars that hold the food, the fridge functions like a classic vending machine, but using it certainly feels like flying first class instead of economy. 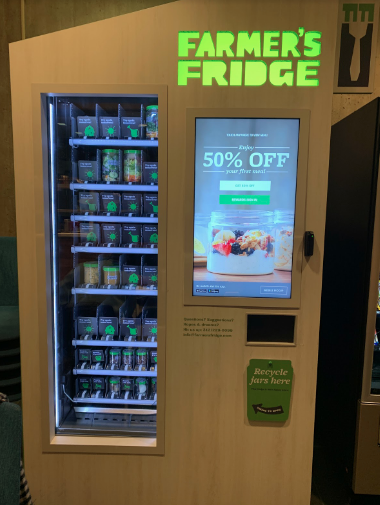 Weinberg Senior Aaron Strauss first saw the fridge at the airport – not the library – when he needed something quick, healthy and affordable while waiting for his bags. Strauss never felt compelled to purchase Bergson’s premade food, so he cannot compare how the fridge rivals the old options. But he loves that with the fridge, he can be part of a reward system automatically without having to go through the hassle of adding Cat Cash and Dining Dollars to his wildcard. Edson Montenegro, a senior Communications major, enjoys the Cobb and Southwest Salads. As a pescatarian, he’s always looking for healthy food options, but does not have time to go to Norris. He also likes that he can save the plastic jars to store other food later on. Sage Ressler, a junior studying Radio/Television/Film, finds the fridge unappetizing. Rachel Orbach, a sophomore studying Economics, agrees with Ressler. Her concern lies in the fact that she is unsure how long the meals have been sitting there. The fact that it comes out of a vending machine – no matter how nicely designed – still makes her think of it as unhealthy. However, the touch screens on the vending machines clearly show the ingredients of every food item and their prices. With a couple clicks and a credit card swipe, the machine can pop out a healthy Cobb salad. Furthermore, the Farmer’s Fridge donates unpurchased food and refills the machines once a day, ensuring freshness. But this fact is not obviously shown on the fridges.